This painting looks incredible. It has loads of fabulous detail and looks extremely life-like. please, can you tell me how you did this? You are so incredibly talented... That means another watch for you. this one is amazing too! NONE CAN CHALLENGE ME, FOR I AM THE STUPIDLY AWESOME IRRITATOR!!!!! MUHUHUHAHAHAHAHAHAHAHAHAHAHAHAHEEACK!! !KAFF KAFFBLECHCOUGHCOUGHCOUGHAAACKBLEEHAAGH.......ahem......HAHAHAHAHAHAHAHAHAHAHAHAAHAHAHAHAHAHAHAHAHAHAAHAHAHHAHAHAHAHAHAAHHAAHAAAAAAACK! Beautiful work. Love the vivid colors. 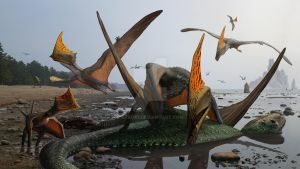 OT: What is up with these new dinosaur names of late? Your works is so fantastic! Could you pls make one for Wuherosaurus or Sauroposeidon?? Wait for your next incredible work! I went to the place where the irritator were discovered, in santana fomation I belive. Can you do a angaturamas? It's the same thing. 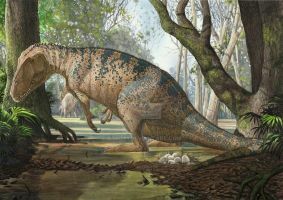 Irritator=Angaturama. mangrove jungles are important in drawing of spinosars background! Awesome jaw of the irritator! я максимально упростил фон, чтоб не сильно "пластмассово" выглядело. А птерозавры - кто такие? 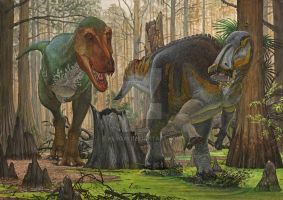 Spinosaurs had such an awesome and weird diversity of skulls. 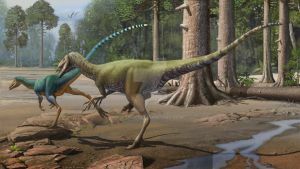 Spinosaurs actually had pretty uniform heads. Long, toothy, crocodile-like skulls. But they were quite impressive. I would beg to differ, they were as you said mostly..some less long than others, some thinner, some more stocky, ect. 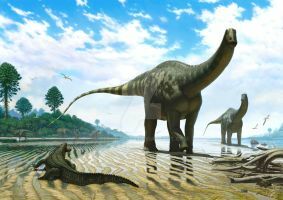 Compare Suchomimus and Spinosaurus for instance. 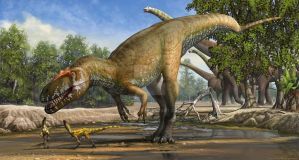 Such has a long thin skull, but thick in height, Spinosaurus not so thin in width but thinner from the side. 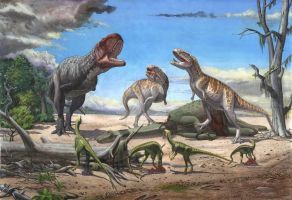 I guess I meant spinosaurs had comparatively similar skulls, as apposed to being radically different. But yes, there is some diversity among them. I got you, that's all i was trying to say as well.